The first Album from the Polish Warriors is out. 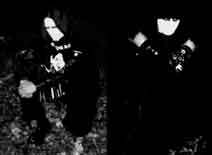 Wait True Antichristian Black metal,following the Polish sound. A Masterpeice! The second album from this killer French black act. Pure hateful raw black metal filled with an obscure freezing production will only manage to fill your mind with the most negative unearthly feeelings. After 33 months of activity ISO666 is proud to have out the first label compilation CD. Contains 1 track of each band we have released so far (till No IS17). total playing time 70 min. Don't send any email to this addresses! A split tape with Nemeton is just out, also the vinyl version of "Vice, suffering and destruction" is confirmed, email the band for more details and ordering info. Will release a split cd with RITUAL DAY (China). Its planned to be out this summer from MORT Productions (China) in 1000 copies. Out now the split ep BLACKDEATH / BLOODHAMMER. Email now the band to get a copy. VARATHRON "The Lament of Gods"
VARATHRON "His majesty at the swamp"
DEATHSPELL OMEGA "Inquisitos of satan"
HATE FOREST "The Most Ancient Ones"
VINTERRIKET "...und die nacht kam schweren schrittes.."
SCEPTER "I'm Going To Hell"
GRABNEBELFURSTEN "Dynastie oder wie man"
HAEMOTH "Vice, suffering and destruction"
ODELEGGER "The end of tides"
HORDES OF THE LUNAR ECLIPSE "Dancing demons in the grey.."
DEMONCY "Empire of the fallen angel"
GOSPEL OF THE HORNS "A call to arms"
AD HOMINEN "...for a new world"
XASTHUR "The funeral of being"
HELGRINDR "Von den vorfahren herstammend landen"
VOLKIENBLUCHT "To consume the darkness whole"
DARKENED NOCTURN SLAUGHTERCULT "Follow the calls for battle"
NORDISCHES BLUT "Our banners will rise"
CARPATHIAN FOREST "Through chasm, caves and titan woods"
JUDAS ISCARIOT "To embrace the corpse bleeding"